The Tesla Model X SUV unveiled Tuesday (see full reveal video feed) to screaming fans is the “safest SUV ever,” CEO Elon Musk said, going on to describe its autobraking and automaneuvering, lower probability of a rollover and reduced side impact potential. The SUV brakes for vehicles in front of it and swerves to avoid something about to impact its side, and both features are standard, Musk said. If the driver does rear-end someone, the front trunk of the Model X produce a “much larger distance for the crumple zone,” Musk said. He contrasted that with a traditional engine block that could compress into the passenger compartment. Musk said the result would be a five-star National Highway Traffic Safety Administration rating in every category, which indicated that the odds of a serious injury at high speed fell to 10 percent. 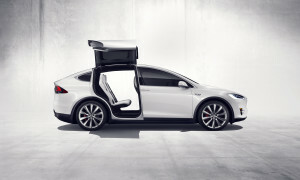 He argued that Tesla deserved nearly a sixth star, as it expected to cut that probability to 6.5 percent. If the side impact sensors can’t prevent a crash, the Model X might not suffer as much damage, according to Musk. He said a side-impact pole collision to the Tesla Model X would only damage the vehicle “half of the next best” in the SUV class. If a side impact did occur, it’ll be interesting to see how difficult it’d be for a collision repairer to work on Tesla’s innovative rear doors. Tesla calls them “falcon-wing,” because “gullwing” presumably wasn’t cool enough for the Apple cult of the car world (until Apple makes its own car). However, the doors are admittedly quite remarkable. Because of their two hinges and an aesthetically hidden internal sensor, they can adapt to their environment rather than raise in a single arc. Tesla demonstrated Tuesday how the doors can sense the height of a garage or a narrow parking fit and open accordingly to let you in or out without banging into a ceiling or adjacent vehicle. In a nifty demonstration, Musk showed how even a traditional minivan sliding door could still deny its occupants entry in a parking lot — but the Model X wouldn’t. Still, luxury collision repairers obviously have an interest in the brand. For them, the Model X would seem to deliver a reduction in some collision-related business but higher bills related to damage to other features — doors which can sense the environment (the front door functions like an “invisible chauffer”) and have more interesting hinges, for example. We’ve emailed Tesla for more comment on collision repair-related angles, including if collision repairers certified for the Model S will need any additional training or equipment for the Model X. However, mainstream repairers should take note as well, for some of this technology could make the cut over to the Model 3, which is aimed at the masses. Musk tweeted this month that the car would cost $35,000, be shown in March and not be produced for two years.